CPS Landscapes - Garden Services, Landscaper based in Portslade, East Sussex. 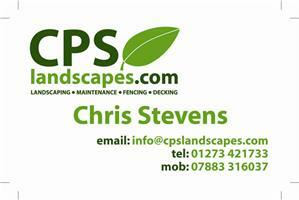 CPS Landscapes has been running for a 7 years and the owner Chris Stevens has got 18 years experience in the trade. The company takes great pride in customer satisfaction. The services we offer include: Brick Laying, Fencing, Ponds, Patios, Driveways, Turf laying, Decking and Wooden structures.